The United States is prepared to resume talks with North Korea on denuclearization following North Korean leader Kim Jong-Un’s summit this week with South Korean President Moon Jae-In. U.S. Secretary of State Mike Pompeo said he has invited North Korean Foreign Minister Ri Yong-Ho to meet with him in New York at next week’s United Nations General Assembly. “This will mark the beginning of negotiations to transform U.S.-DPRK relations through the process of rapid denuclearization of North Korea, to be completed by January 2021, as committed by Chairman Kim, and to construct a lasting and stable peace regime on the Korean Peninsula,” Pompeo said in a statement. Tongchang-ri has been North Korea’s main satellite launch facility since 2012, according to monitoring group 38 North. It has also been used for testing engines for North Korean missiles capable of reaching the United States. 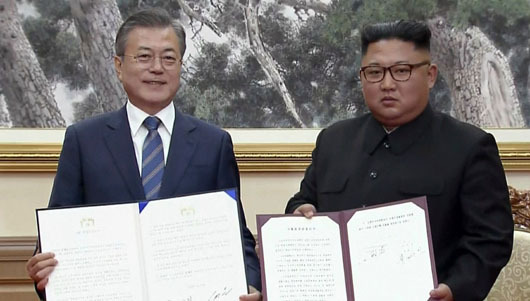 Moon said both he and Kim “agreed on a way to achieve denuclearization” on the Korean peninsula. Kim also said he hoped to “visit Seoul in the near future.” If Kim does visit Seoul, he would be the first North Korean leader to do so.